The Ibanez GSRM20B features a smaller and more comfortable design that is aimed at players with smaller hands. Crafted with a poplar body and jatoba fretboard, it offers good levels of projection and sustain, with a tone full of warmth and depth. The exquisitely designed body encompasses everything we've come to know and love about Ibanez. The shallow body depth is paired with smooth bevelled edges to maximise comfortability, whilst the carefully contoured body profile gives way to deep double-cutaways that maximise upper fret access to give you total freedom across the neck. The body is built from mahogany, which establishes a warm midrange foundation that is adaptable to any musical style. The lightweight feel of the bass is matched by a sturdy and reliable build quality that instils the utmost confidence in its ability to hold up to whatever you throw its way. Fitted to the body is a sleek maple neck, which is shaped to the fast playing GSRM4 profile to optimise the smoothness of the playing feel. Paired with the neck is a jatoba fingerboard, which is home to 22 medium sized frets that are adorned with white dot position inlays to aid in your navigation. As previously noted, the body features deep double-cutaways that allow your fingers to reach each and every fret with ease. 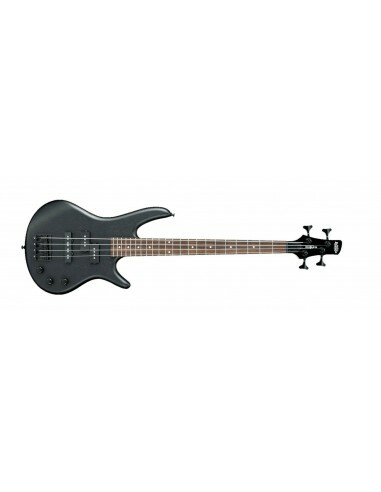 The Ibanez GSRM20 Spot Run Electric Bass Guitar is equipped with a pair of Dynamix pickups, with a P in the neck position and a J in the bridge position. The pickup arrangement maximises the tonal versatility of the mahogany, delivering a smooth output that can be tailored to your needs using the independent pickup volume controls and master tone knob. Fitted to the body is an Ibanez B10 bridge, which creates a seamless connection between the strings and body to optimise intonation and sustain. The tuners work in partnership with the nut to uphold tuning integrity and consistency of tone beautifully. The sophisticated chrome finished hardware complements the finish in style. The Ibanez GSRM20 Spot Run Bass Guitar is a fine model for anyone dipping their toes into the world of bass guitar for the first time, anyone with a shorter reach who prefers a shorter scale, or anyone who wants a bass to travel with that is built to last and sounds pretty awesome too.